Aimee Bartis: Light it Up! Yesterday I wrote about my love for Christmas cards. Another of my favorite things about Christmas are the lights. Especially the lights around our house. Generally, I like the house on the dark side. Dark usually equates with comfy and cozy to me. Add white Christmas lights and blanket to that and I'm in for the night. 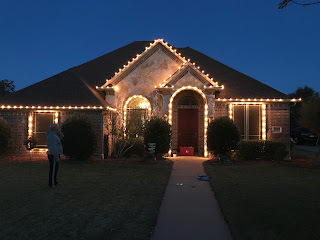 I want to share some of our Christmas lights with y'all! This is our candy cane tree (everything on it is red, white and silver) plus a ceramic tree that my momma made when I was little. The ceramic tree is the only multicolor lights in the common areas of the house. B and Zac have multicolor lights on the trees in their rooms. But generally, I only like white lights in our family areas. But my ceramic tree is the exception. This is my view each morning during my devotional. This is our Disney/keepsake tree in our bedroom. I love laying in bed at night with this tree on. Besides all my Disney ornaments I put all the boys' photo ornaments, baby's first Christmas and other keepsake ornaments. This is our mantle. More Disney here. Ryan and I got our stockings when we were dating. When Zac was little, I ordered the stocking holders. I ordered an extra for giggles and it turned out we needed it for B-man. B's is the only holder with out a picture. The rest of us have pictures from a Disney World trip before B was born. Every year I say I'm going to print out our names in a cute Disney font so everyone would be the same. And every year I forget to do it. Maybe this is the year...doubt it. When we first married my goal was to have all Disney Christmas decorations. I found out very quickly it's hard to find high quality, nice looking Disney decor outside the parks. So, I have areas of Disney - the mantle, my Disney tree, a Disney advent calendar and wreath (purchased in the park) and a Mikey and Minne swag that I put together myself in those early years. And last but not least, our house. Ryan worked really hard on the house. The boys helped, ever so slightly. Do you prefer white lights or multicolored lights at Christmas?